The script gives you the option of having an absolute path to the instance which allows you to paste the instance in a different comp or to leave it as a relative path if you are pasting the instance in the same comp. If you would rather not have to think about this, it has an AUTO mode where it will decide for you. 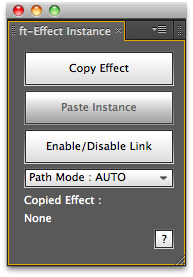 The "Enable/Disable Link" button allows you to disable the expressions that connect it to the master effect. When you disable a link it hard sets the values so it essentially makes a hard copy of the master effect.